Our MULTIEYE ANPR license plate recognition complete packages are available in different versions for 1 to 2 lanes and driving directions. These consist of a MULTIEYE GreenWatch 4-channel network video recorder with installed ANPR software module Gate or Traffic, Bullet IP video camera(s) with IR and motor zoom, PoE power supply, 23" monitor, EX-IO Sever and remote commissioning support by artec factory technicians. In addition to automatic license plate recognition, the entry and exit process is also recorded. Depending on the complete package, up to 3 additional IP video cameras can be operated on the GreenWatch Recorder. 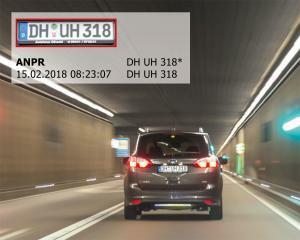 The MULTIEYE Gate system recognizes and stores the license plates of incoming and outgoing vehicles as well as the video images. The license plates can be compared with a "Black & White list" for time-controlled access control. Barriers, gates, signal lights can be controlled via the EX-IO module. The license plate information is stored in an encrypted database and can be analyzed with the standard evaluation tool. In addition to Gate, the MULTIEYE Traffic System includes a premium evaluation tool with versatile filter functions. In contrast to Gate, the license plate information is stored in an SQL database, which is accessible for customer-specific applications and further processing.